Looking for the collective opinion on the viability, costs and who to go to do the work for the fairing repair shown below. (Highlight it and right click go to picload in the drop down menu) Sorry but I'm new to this and can't get it to up load the image direct to the post and am having a problem with the forum upload, says I'm not logged in. Anyhow that,s not what this is about. I'm looking to buy this from Europe but as stated above would appreciate your collective input on the fairing damage. Bike has 16k miles, non original indicators, lights work in the pic but as yet no idea on the state of the engine or if it runs or the tyres or what if any service history. private buyer with a nice garage is all I can see from the background. Good points new front discs and pads and a Lafranconi system is included. I'd very interested to know your thoughts. I missed out on one of these a few months ago and am still in the hunt. Bike does look nice...especially for the money...and you've figured out the mileage in Kms is 27,104 and not 21,794 as he has listed. New discs...Hhmm….bit cheap I'm afraid.....£250 of brembo SS discs used whereas Original fittings are £700 of cast iron full floater brembos.....Maybe its just the angle of the photo....but from the left side view of the front disc...it seems like its a 300 or 310mm dia disc and not 320....caliper seems way beyond the perimeter of the disc edge...and as such not getting a full grab on the disc...…. as what 2bims said - it looks a bit "jaded" (dull carbon front mudguard shows a lack of care) but the bike would probably scrub up OK with plenty of TLC. At that kind of mileage it probably needs a new chain and sprockets and a full engine service (if there is no service history with it). To use as a "rider" it's got all the makings of a good bike. I would take the time and look for one there. If you need help with german, I can translate for you or go check one out if it is not too far. Regarding Paint. My SB6 went down once and the pre-owner had it fixed up really good with original paint. The remaining paint including the bill was given to me in-case I need it. …. The red, white , black and clear coat paint as set was 600€ + Postage without any Labor. So it might be more expensive to fix that, then one might think. Gentlemen, sorry for the slow response. My brother is here from Canada, which inevitably led to some alcoholic excess. I have read your comments with interest, they were exactly what I needed especially around the new discs. I'm also grateful for the offer from O Roger for contact and translation. Not sure what I'll do with this one, no need to buy the first one I see and it's a long trip for what might prove a fruitless haggle. In the meantime here is another from the site suggested by Roger correct discs, I presume, mismatched indicators and no transfers on the main fairing crash damage?, external fuel taps by the rear shock and perhaps something missing from the mirror mounts inside the fairing? I'll ring him today and see what he has to say about the fairing and as mentioned whether there are dings to the swinging arm from the pegs if it has been down the road. that looks OK for the money. My concern would be why there are no pictures of the other side of the bike? Maybe ask to see some before travelling to see it. 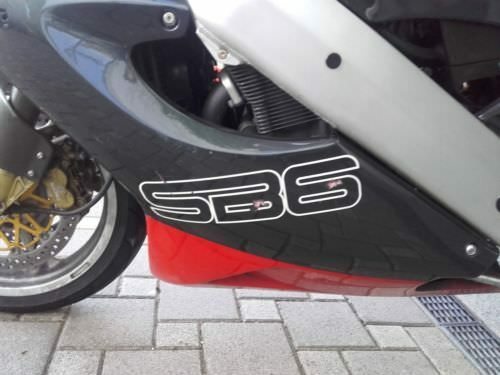 someone in the UK is selling 2 x SB6's on the Farcebook "Bimota Forum". No details - you will have to message him. Looks fairly clean but not perfect. Incorrect indicators, lower fairing may have been resprayed as the Bimota decal is missing, missing frame grommet. Need photos of the left side as previously stated. Those fuel taps are hurting my eyes, I’d get rid of them as there’s no need for them. The front rotors look to be the same as the stock rotors on my DB4, so maybe the factory had a few different rotor designs laying around at the time? I got one reply from him... but when I asked him if he was on the uk forum, he hasn’t replied.